Nvidia hopes to equip drones and robots with high-performance computing capabilities with its new Jetson TX1 developer kit announced on Tuesday. The kit includes an uncased board with all major components on it. It's the size of a credit card, but with 1 teraflop of horsepower delivers more performance than other developer boards available today. Robots and drones require autonomous and smoother navigation capabilities, and the TX1 will help enable such capabilities, said Jesse Clayton, product manager at Nvidia. Robots and drones will be able to recognize objects and avoid collisions using "deep-learning" algorithms and image processing engines on the board, Clayton said. The TX1 has 256 graphics cores to process images. Nvidia is providing a software development kit for theTX1, including a debugger, compiler, libraries and other tools. The SDK will help programmers load applications that allow robots and drones to be truly autonomous, Clayton said. The SDK is based on Nvidia's CUDA parallel programming framework, and taps into technologies such as OpenCV, OpenVX and Nvidia's VisionWorks for image recognition. The board also supports OpenGL and OpenGL ES graphics standards. The board could also connect to more powerful cloud services for post-processing of images, Clayton said. Nvidia -- known for its graphics chips -- has already done work that helps self-driving cars recognize objects, signs, images and lanes. The company is bringing similar deep-learning capabilities to TX1. The TX1 is more than three times faster than last year's original Jetson board, which delivered 300 gigaflops of horsepower. The TX1 has a Tegra X1 chip -- which is also used in cars and tablets -- with 64-bit ARM CPUs. Additional specifications include 4GB of DDR4 memory, 16GB of storage, Ethernet, 802.11ac Wi-Fi and Bluetooth. Connectors on the board allow GPS, camera and other modules to be plugged in. The board supports the Linux For Tegra and popular ROS (Robot Operating System), which is widely used in robots. 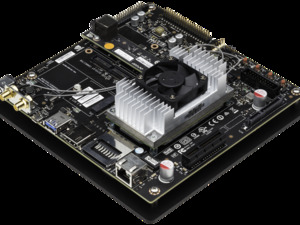 With support for Linux, it's possible to use the board as a Linux gaming PC, like the predecessor board. The TX1 does not support Android. The developer board will be available starting on Nov. 16 for US$599 through online retailers like Amazon and Newegg. It will initially ship in the U.S. and then worldwide next year. A stripped down version of the board without major components and connectors will be available next year for $299, in volumes of 1,000 units.